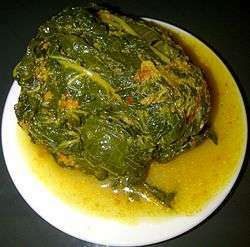 Buntil is a traditional Javanese dish of grated coconut meat mixed with teri (anchovies) and spices, wrapped in papaya, cassava, or taro (or other similar aroids) leaves, then boiled in coconut milk and spices. It is a favourite dish in Java, and other than cooked homemade, it is also sold in warungs, restaurants or street side foodstalls, especially traditional temporary market during Ramadhan, prior of breaking the fast. ↑ Badiatul Muclisin Asti & Laela Nurisysyafa'ah. Kumpulan Resep Masakan Tradisional dari Sabang sampai Merauke. Media Pressindo. ISBN 9789797880729. ↑ Slamet Susanto (26 August 2010). "Ramadan's streets of culinary delights". The Jakarta Post. Retrieved 12 June 2015.